Feel like your out of balance? You are not alone. Let me guide you through simple yet life changing techniques that will get and keep you centered. Be the eye of the storm instead of at the effect of it. My Dream analysis can guide us toward what we need to heal and how to follow the desire of our sacred self. 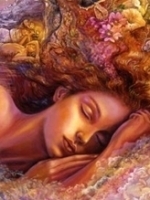 I can teach you how to use the dream time as a powerful tool. Describe your areas of expertise.I specialize in: Love, relationships, soul mates, dream interpretation and life coaching. How long have you been aware of your abilities, and how have you developed them?Since I was a child I knew I was different and knew that I had a calling to help those in need. As I grow older my abilities also grow stronger after each session. Name some specific experiences where you've used your abilities.A former client of mine was searching for her soul mate. With 2 sessions, she was able to find the person she now spends the rest of her life with. What can a caller expect from a consultation with you?True honest answers and clarity.